I am not writing this blog because I want you to feel sorry for me, and I dare you to pity me at your peril. I am writing it because I feel there needs to be some dialogue around the feelings experienced by individuals, as a result of exclusion and marginalisation within their workplace. It is only by speaking out and telling our colleagues, peers and leaders within our organisations about our experiences that we can make the changes necessary to tackle exclusion. Exclusion and marginalisation can be experienced by individuals because of their sexuality, race, gender or disability. Having contracted measles at the age of six, I have been profoundly deaf and need to wear behind the ear hearing aids, and so, I sit firmly in the disability group. I was a challenging pupil through my school years, not wanting to wear my hearing aids and as a result became bored and disruptive. Still, I went to university and completed a psychology degree followed by a diploma in nursing. Throughout this time, I never felt excluded in any way. Sure, it was often an inconvenience having a disability but I never felt embarrassed about it, nor did I ever feel excluded. The feelings of exclusion and of ‘not being good enough’ began when I started work as a nurse. Fortunately, I’m a tenacious individual and have continued my nursing career despite both subtle and not so subtle slights that occur daily, in response to my deafness. For example, when I was a newly qualified staff nurse, I was taken to one side by the matron, because a number of nurses with significant combined years of experience, felt I wasn’t capable of doing my job properly due to my deafness. Once, I had to wait for three months, before the amplified phone on the ward I was working on, was mended. Sometimes, I’m embarrassed on hearing the imperceptible exasperation or the annoyance in someone’s voice when asked to repeat themselves and, when they do, they often speak unnecessarily loudly. And, I sometimes fear to speak up in meetings when I haven’t quite heard what someone has said, in case I’m seen as being incapable. Another thing which often happens, is being defined by my disability, for example, being called ‘the deaf nurse’ or ‘the one with the hearing aids’ by both colleagues and relatives of patients. This is how it feels to be excluded and marginalised and many of your colleagues will be experiencing similar feelings in their everyday working lives because of their race, gender, sexuality or disability. If I can ask readers just one thing, it would be to walk a mile in the shoes of the person you treat differently to others. You can help put a stop to exclusion and marginalisation by treating everyone the same and expecting that courtesy from everyone you work with. People need to listen to the feelings of people who have experienced exclusion and marginalisation because only by acknowledging that this still occurs can change begin to take place. As part of the Transforming Perceptions of Nursing and Midwifery campaign, myself and fellow ambassadors are celebrating the diversity within nursing and midwifery by joining the October 30 day challenge which was launched in May by the Chief Nursing Officer for England, Jane Cummings. In order to have a diverse workforce, nursing needs to show that it can be inclusive and welcome people regardless of their age, race, gender, sexuality or disability. This requires all of us in the nursing profession to be aware of our actions, our words and the effect they can have on people. Society is becoming increasingly diverse with nursing and midwifery reflecting this more and more. We pride ourselves on being a caring, inclusive profession so let’s look out for each other, regardless of our background, and promote a workplace experience that is inclusive and supportive, where each member of staff is valued equally. She qualified as a nurse in 1998, starting her career in orthopaedics and general medicine, working in hospitals across Lancashire. 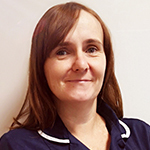 She has spent most of her time in secondary care and prior to her current role has specialised in acute medicine, respiratory, diabetes and medicine for older people. Joanne loved reading your blog you are a inspiration to yourself and others. Fantastic hands on nurse!always goes above and beyond. What an inspiration Joanne is and proof that regardless of disability you can achieve. When I work alongside Joanne I see a passionate,proud ,competent and caring Ward Manager/Nurse-not her hearing impairment. Diversity is needed in the workplace to appreciate and gain from a wide range of abilities, skills and perspectives and reflect a true society.